1) A device to show when the magazine was empty. 2) Location of the safety-lock where it could be more easily seen. 3) Redesign to permit removal of the bolt mechanism without disassembly of the whole arm. 4) If the device for regulating the gas vent was necessary, some means of showing the corresponding position of the vent. 5) An arrangement to permit using the service cartridge clip. The second endeavor to devise a method of converting the M1903 to a semi-automatic was Franklin K. Young’s then of Chatham, Massachusetts. Young obtained from the Armory one of the new 1903 service rifles from which to work and wrote in the fall of 1906 to say that his converted model was completed.37 But the invention later described by Colonel A.H. Russell of the Ordnance Department as “built up by additions to the present Springfield magazine rifle, with, perhaps a few changes,”38 was not submitted to examination at the Armory until November 1910. The model was not constructed for a severe test but the design gave such promise that the Board recommended fabrication of a rifle of strength to withstand the regulation test. A modification of the M1903, Young’s rifle omitted twenty-three parts but replaced these with thirty-one, and contained three springs fewer than the service rifle.39 The cost of manufacturing guns of this design in quantity was estimated by Colonel Blunt of the Armory to be $16.00 per rifle. 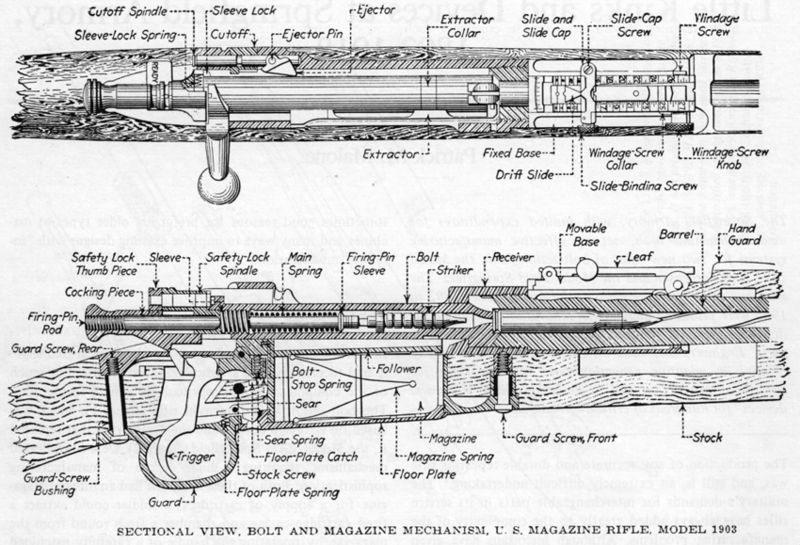 “This design follows so closely that of the regular service rifle that but a few alterations would have to be made in the machines, tools and fixtures; hence the low estimate.”40 Young therefore began work upon the manufacture of a carefully built rifle, but did not present it for further examination until October 1912.41 Although after attempting to meet criticisms made then Young again brought his rifle to the Armory for view, still no formal test was made.42 By special action of the Board of Ordnance and Fortification at this point (March 1913) arrangements were made to have one rifle of the design manufactured at the Armory under the supervision of the inventor.43 After some months work the mechanism was informally tested several times in the fall of 191344 only to have the Commanding Officer report that the final successful operation of the mechanism was not due to any of the features of Young’s design, but was wholly dependent upon the inclined bolt lug. As funds allotted for experimentation upon this design were expended Young was informed that further development must be conducted elsewhere at his own expense.45 The mechanism was never resubmitted for test. A third scheme for converting the service rifle to a semi-automatic was offered by Grant Hammond and his backer Dr. Thomas Darlington in December 1909. As in the case of the Smith-Condit device and the Young, the advantages of a conversion in place of a wholly new arm were self-evident. The first tests, begun on December 10, 1909 and continued from February 18 to March 1, 1910, and renewed on June 24, 1910, showed the gas-operation attachment not strong enough for service use, the action affected by dust and the rapidity of fire attainable insufficient.46 In June 1911 again Hammond submitted for test an attachment based this time upon a different principle. The report upon this rather reluctantly pronounced the defects too numerous and too hard to overcome to warrant further consideration of the device. The Board thought the mechanism complicated and likely to get out of order; the rapidity of fire was less than the desired ninety rounds per minute; misfires were too frequent because of uncertainty of action of the firing mechanism; the bolt catch was uncertain of action; the gas chamber tended to clog with residue from the powder; the metal parts were exposed where likely to burn the hand of the rifleman; the springs and main spring were affected by the heat generated in firing; cartridge loading and ejection was uncertain; balance was poor; and the bolt flew back and forth so rapidly when the attachment was in use that it would strike the hand of the soldier holding the gun as many did.47 In spite of this damming list of faults the Board was apparently regretful to reject wholly the Hammond attachment for, assuming that it were possible to remedy the weaknesses named, the cost of conversion of 1903s already in service was estimated at $35 apiece.48 But in September 1913 the final verdict was given that it was too costly for the Ordnance Department to try to develop any revision.49 This decision was doubtless influenced by the hopes still at the time held of the feasibility of the Young mechanism on the one hand, and the enthusiasm over the seeming possibilities of Captain Sheppard’s rifle or the Bang, on the other.